The recent London Collections: Men autumn/winter 2015 shows were a hotbed for burgeoning hair trends, with the majority of brands shunning exaggerated, overly stylised cuts in favour of more modest, easily achievable styles. Many designers took an unfussy approach to hair this season, choosing to keep plenty of length through the top while styling the hair forward onto the face. Though the basic structure of the cut was similar for several shows – long and fairly loose through the front, and only slighter shorter at the sides and back – designers tweaked the blueprint to coincide with their desired aesthetic. At Christopher Shannon, the brief was 1990s ravers with bowl cuts. Hair oil was used to produce a wet look finish, as though to suggest the models had slightly sweaty hair from dancing all night. If you already have good length through the top, you can either wear it straight forward with a full fringe, taking inspiration direct from the runways, or try a loose side parting, with the hair styled off your face. This often feels more comfortable for men who aren’t used, or don’t like, the sensation of hair on their forehead. To get the Christopher Shannon raver look, try applying Fudge Hair Gum/Shaper, Korres Styling Gel or American Crew Strong Hold Gel to damp hair, working it through with your fingers to produce a high shine finish with plenty of movement. For something similar to the styles on show at Tom Ford, Matthew Miller and James Long, apply Fudge Sea Salt Spray, d:fi Beach Bum or Bumble & Bumble Surf Spray to damp hair before letting it dry naturally. A firm favourite of stylists and trendsetters for the past few seasons, slick hair was the go-to for a host of designers at London Collections: Men. At J.W. Anderson, models wore an extreme slicked back style with a high shine that complemented the designer’s signature androgynous aesthetic, while at Gieves & Hawkes, hair was slicked back tight but given slightly more volume through the use of a wide-toothed comb. Casely-Hayford’s models also sported slicked back styles, but these weren’t as precise. A little flick was sometimes used towards the end of the hair, which perfectly complemented the brand’s signature tailoring with a punk-inspired twist. High shine hair is on trend for 2015 and can be styled in a number of ways. Remember that runway looks are designed to be dramatic and often need to be toned down slightly for real life. For instance, if you have a corporate job, wet look, scraped back hair is probably not appropriate for the boardroom. But a neat side parting or quiff with a healthy shine to it? Ideal. 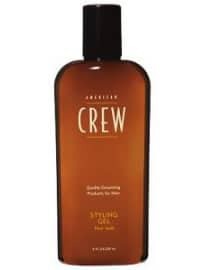 To achieve a shine effect, start by applying some American Crew Pomade/Grooming Cream, Kevin Murphy Super Goo or Fudge Hair Varnish to either dry or towel dried hair. Next, use a comb to sculpt your desired look, working meticulously through each section of your hair – there shouldn’t be a hair out of place by the end. If you’re after more of a wet look, start by towel drying your hair roughly into the position you want to wear it. Next, apply a styling product like American Crew Superglue, Korres Gel, American Crew Medium/Strong Hold Gel or Fudge Hair Gum to the hair and leave it to set naturally. Timeless and classically masculine, the quiff was a firm fixture on London’s autumn/winter 2015 runways. To complement their old-school, generously-cut tailoring, E. Tautz chose a statement quiff with plenty of height at the front and volume throughout. Legendary Savile Row brand Hardy Amies opted for something similar, showing plenty of side-parted quiffs that weren’t quite as dramatic as those seen at E. Tautz. The quiff is a classic, sophisticated and low maintenance cut, making it a fail-safe option for men of all ages. To create this classic yet contemporary style, start by applying a little Tigi Motor Mouth or American Crew Boost Cream to damp hair, before blow drying with a vented brush to create optimal volume. Take care in choosing your styling products as this makes all the difference to the look of your quiff. Arguably the best approach is to sprinkle some texture dust into the root area (try Fudge Elevate Styling Powder) for added support, then comb through a light styling product such as American Crew Texture Lotion to achieve a natural finish. However, if you’re looking for something that will give you more control, without sacrificing volume, try a matte clay or paste like Kevin Murphy Gritty Business, Fudge Matt Hed or Lock, Stock and Barrel Disorder Ultra Matte Clay. Cement your perfectly coiffed style with a super-strong hairspray, like Fudge Skyscraper. Perhaps the most interesting thing about fashion week is that the same models work across so many different events, each with its own specific aesthetic and hairstyling. It just goes to show how much flexibility we have when styling our hair to seamlessly match our outfit. Will you be trying any of these looks for 2015? Do you have any personal tips or recommended products for creating any of these styles? Be sure to let us know in the comments section below. How To Grow A Moustache Like Henry Cavill The star explains how to rock a mowser without looking like Ron Burgundy 8 Men's Jumpers That Will Never Go Out Of Fashion Get knitted out for autumn and beyond Is It Okay To Wear A Down Jacket? It's cosy as hell, but down also has a dark side. Could wearing feathers leave your style out in the cold?